Address: G/F., 130A Jervois Street, Sheung Wan, Hong Kong. 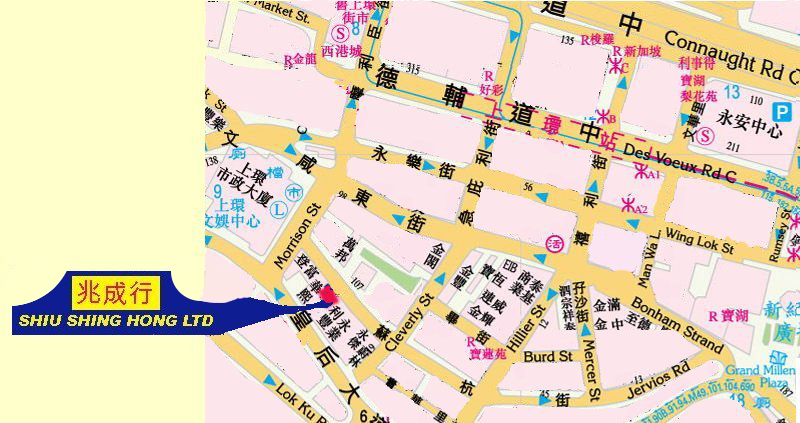 A1 Exit: Walk west on Des Voeux Road Central, turn right to Morrison Street (or Cleverly Street), then turn to Jervois Road to reach 130A, Shiu Shing Hong Limited. A2 Exit: Walk west in Wing Lok Street, turn right to Morrison Street (or Cleverly Street), then turn to Jervois Road to reach 130A, Shiu Shing Hong Limited. From Queen's Road Central turn left to Morrison Street (or Cleverly Street), then turn to Jervois Road to reach 130A, Shiu Shing Hong Limited.